Ever wondered what it would be like to use Malvern’s OMNISEC GPC system? Now you can find out, from the comfort of your own desk! Malvern’s OMNISEC Demo at your Desk webinar provides an in-depth look at the OMNISEC hardware and a thorough demonstration of the user-friendly OMNISEC software. 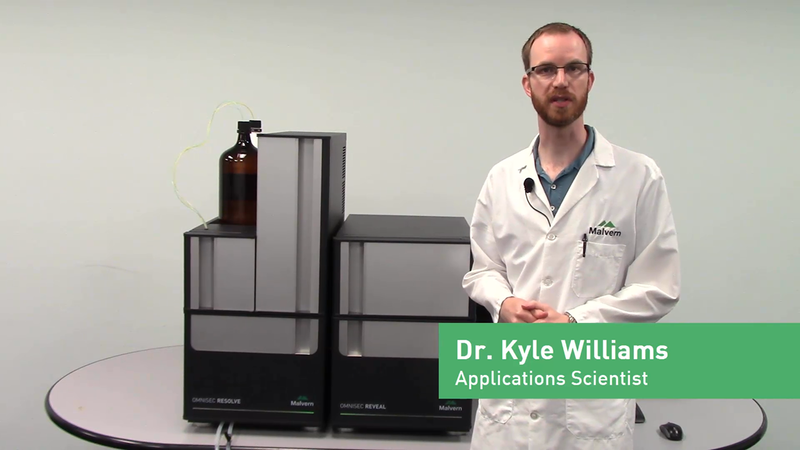 In this webinar, I highlight key features of OMNISEC Resolve, which is the chromatography unit, including the low-volume degasser, low-pulsation pump with back seal washing, autosampler with temperature control from 4-60°C that can make injection volumes down to 5 µL, and a column oven that can house any column set and is temperature-controlled from ambient to 65°C. Then I move to OMNISEC Reveal, the detector unit that contains the refractive index, UV/Vis photodiode array, light scattering and viscometer detectors, which is also temperature-controlled from ambient to 65°C. After a brief foray into GPC theory and some data acquisition, I demonstrate how the OMNISEC software can be used to get the most information out of a single injection of a sample. Molecular characterization data, such as molecular weight moments, dispersity, intrinsic viscosity, hydrodynamic radius, sample concentration, and structural parameters – amongst others- are all just a click away! After the demonstration portion of the webinar, I field a few questions from the audience – thanks again for your interest and attention! The questions received are listed below along with answers very similar to the ones I gave in the webinar, but in some cases with added information for clarity. Hopefully these will help answer any questions you might have regarding the OMNISEC system. If you have additional questions about OMNISEC, please don’t hesitate to get in touch with a Malvern representative! A: Yes! The autosampler is temperature-controlled. It can cool as low as 4 °C and heat up to 60 °C in order to cover a variety of samples and their stability or solubility requirements. A: Absolutely! When you choose which samples data to analyze, you are presented with all of the past sequences recorded. Simply select the sequences (or single injections) you are interested in and open them. All of your selected injections will be listed in the Record View in chronological order, as shown for the four injections in the example below (acquisition date highlighted in yellow). By clicking the first sample injection, and then holding shift while clicking on the last sample injection, all of the injections will be highlighted and can be compared using the Overlay view. The overlay of the right angle light scattering chromatograms of all four injections is shown in the figure below. It is important to note that different run conditions were used for each of these samples (columns, mobile phase, temperature, etc.). A: Since it contains refractive index and UV/Vis photodiode array detectors, OMNISEC can be used to help determine the relative concentration of two components within a sample. This is referred to as compositional analysis, and the most common example is a protein conjugated to PEG or a polysaccharide. This works well because proteins are UV-active, and therefore provide a response in the refractive index and UV/Vis photodiode array detectors, whereas the PEG or polysaccharide portion of the sample is not UV-active and would only be visible with the refractive index detector. A: The OMNISEC autosampler can make accurate injections down to volumes of 5 µL. The autosampler can inject down to 1 µl, but without quite the same accuracy. Additionally, there are different injection options, such as a Zero Waste mode, which means you’re not wasting sample flushing out the sample loop. A: The batch processing mode available in the previous versions of the OmniSEC software (v5 and below) is a feature that will soon be added to the OMNISEC v10 platform. A: Yes! OMNISEC Reveal, the detector compartment, is available in different configurations depending on the needs and preferences of the user. For example, a detector setup including just the refractive index and viscometer detectors is available and can acquire sample data seamlessly, even without the light scattering detector. A: You can monitor the temperature of the autosampler, column oven, and detector compartment, all of which have their own temperature controls, in real time using the Instrument Controls panel in the OMNISEC software. These temperature readings can be viewed during sample analysis, however the optimal conditions for GPC require a constant temperature, so hopefully the temperature is not changing during a run. A: Yes! All of Malvern’s GPC instruments are compatible with organic and aqueous mobile phases. Solvents used range from THF, DMF, chloroform, DMSO, HFIP, etc. to aqueous mobile phases such as sodium nitrate or sodium sulfate solutions to phosphate buffer solutions and even 5-10% acetic acid in water. A: Yes! OMNISEC Reveal as an advanced detector unit is available on its own, separate from the OMNISEC Resolve front end. As mentioned above, it is available in a variety of detector configurations to best suit the needs of each user. A: Unfortunately, as with all GPC units, identifying the molecular structure is a bit beyond the scope of OMNISEC. However, by using advanced detection and considering data from the viscometer and light scattering detectors, clues can be ascertained about the molecular structure of a sample or group of samples. For example, a user could determine the Mark-Houwink parameters of an unknown sample and then reference a table of established values for clues on molecular structure and identity. A: GPC analysis of fluorescent samples is tricky. If the sample fluoresces, the emitted light can certainly interfere with the light physically scattered by the sample and distort the molecular weight data calculated. A potential solution to this problem is to connect Malvern’s SEC-MALS 20 detector, which has fluorescent filters that can help alleviate the issue.